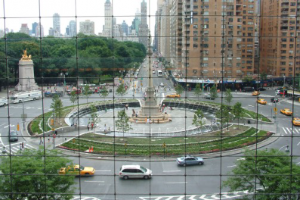 Columbus Circle | Custom & Private New York Tours, Inc.
A new town square will impress you for many good reasons; The Sr. Norman Foster Hurst Building, a $500 million skyscraper literally built within a six story-surviving landmark. Hurst headquarters erected in 1929 did not prevent the construction of this beauty. The Time Warner Center, (2002) the nation’s largest mix-use building, most expensive home purchased in New York City, $88 million at that time, is located next to Trump International Hotel and Condos that’s been re-clad demonstrating “if you can’t replace it then reface it.” 15 Central Park West earned $600 million for the Zeckendorf family but, perhaps they may have been a big mistake. You’ll find out how and why it stays the same. 220 Central Park South, down the block, currently under construction, boasts the record for a home price of $250 million, currently in contract. Does that make sense?